Israel forces have been attacking Gaza, destroying power grids, destroying infrastructure and killingcivilians. They intensified the brutal attack after two home made rockets landed in Tel Aviv. Hospitals in Gaza are at the breaking point trying to deal with casualties while under siege for years. But resistance forces in Gaza also reported dowing an Israeli jet. Israeli authorities are caught lying to their own people about the extent of damage coming from the resistance (e.g. saying the rockets were intercepted and did not fall while Israeli citizens see them fall, fires breaking and ambulances rushing in. I myself heard the sirens blaring in the settlements of Gush Etzion and heard the thud of one largeb rocket (presumably of the long range Fajr type). But now for an analytical comment. Is history repeating itself? The Israeli attack on Gaza this week is happening between the US Presidential elections and the Israeli (early) elections. The attack on Gaza four years ago also happened after the US elections and before Israeli elections. Some Israeli citizens thus put an advertisement in an Israeli paper titled "No to the election war!" Netanyahu and company today are trying to repeat what Olmert and company tried to do four years ago: pound Gaza into submission while gaining right-wing votes. This attack could also be a test of preparedness for a coming war on Iran (Gaza is weaker than Lebanon or Iran). Early results show that the Israeli hasbara spin machine failed to make the attack on Gaza appear as "self-defense" and will fail at all its other goals just like happened in 2006 and 2008. 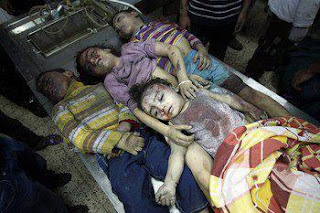 During the last attack on Gaza four years ago Israeli forces murdered 1400 Palestinians including nearly 400 Children in a period of just three weeks. It was and remains a difficult propaganda task to hide the scale of atrocities against natives especially when all human rights groups and the UN describe such actions as war crimes and crimes against humanity. In Gaza just in the last 48 hours, the martyred Palestinians included two babies 10 and 11 months old. Netanyahu hopes the Zionist media network and his bombing campaigns succeed in 2012 at what they failed to achieve in 2008. Israel as an occupier/colonizer hopes to get away with murder while labeling any resistance from the occupied people as "terrorism." In the age of instant communication it is difficult. After repeated aggressive wars (e.g. in 1948, 1956, 1967, 1982, 2000, 2006, 2008, and now 2012), the world is finally waking up. People of the Arab world who engaged in real democratic revolutions now demand real change. It is symbolically significant that high level officials from Egypt and Tunisia traveled to Gaza during the current attacks. People know that Israeli lobbies like AIPAC (whose website was hacked by Anonymous this week) keep pushing for wars including an illegal war on Iran in the same way as they pushed for the illegal war on Lebanon and Iraq before. The latter war was foisted on the Western public using lies (connections of Iraq to terror actions of 11 September 2001 and weapons of mass destruction). The war cost thousands of American lives, hundreds of thousands of Iraqi lives, and $3 trillion in direct cost to US taxpayers. People know that Gaza is still under occupation per international law as the UN itself reported. Even Israeli spokespersons and an Israeli document released by court order showed Israel is engaged in collective punishment of Gaza population, a crime against humanity per international law. The UN warned of a humanitarian catastrophe if the Israeli siege of Gaza continues. Israel also continues to target any and all humanitarian ships trying to break the siege. Israeli politicians find it convenient every few years to launch a massive war to keep the "home-front" scared and united and hope to bolster their political careers. "Rooting out terrorism" and keeping "Israeli citizens safe" are now seen even by Israelis as simply propaganda. Israeli intelligence reports submitted to the Israeli government showed that Hezbollah became even stronger after the Israeli attacks of 2006 and that Hamas came out stronger after the Israeli attack in 2008. Impoverished Gaza is teaching all lessons. Olmert and Livni discovered that war crimes do not necessarily translate into votes. A more important lesson that may take longer to sink in is that safety does not come from oppression and ethnic cleansing, the two pillars of Zionism. Safety comes from justice. Israel is a racist apartheid and militarized state that caused the largest remaining refugee population on earth (7 million of the 12 million Palestinians are refugees or displaced). Peace can come by acknowledging wrongs and engaging in restorative justice. After the return of the Palestinian refugees (including the one million in Gaza) to their homes and lands occupied in 1948, we can all live here regardless of religious or other backgrounds in one secular democratic state. I suspect the Israeli immoral and cruel attacks on Gaza will hasten this inevitable outcome. Today, Jewish settlers came to Beit Sahour to look over the area they want to build the new settlement on. Last night, settlers tried to burn a Palestinian family home in Tequa. This week, Israeli ministers give speeches that says they support new settlements and expanding existing colonial settlements. The Jewish state's finance minister even admitted doubling the financial support for these settlements built on stolen native Palestinian lands. The last few days there was an escalation of the Israeli bombing raids in Gaza. US-made airplanes, paid for by US taxpayers, and painted with the star of David, were used to kill several Palestinian civilians and at least two Palestinian militants (extrajudicial assassinations). Israeli occupation forces are threatening more strikes and more colonialism. Many Palestinians were relieved to see Obama win the US presidency and some 80% of Arab Americans voted for him. But Obama said nothing about these atrocities since his election. The US position is what it is and will change only when more Americans are made aware of the Zionist damage to US public and economic interests. The Israeli position is also predictable until more Israelis can transcend their brainwashing. What is less understandable and more disturbing is that we still hear the same rhetoric from the two "Palestinian authorities" which have no authorities and whose terms in office expired nearly three years ago: Hamas in Gaza and Fatah in the West Bank. Some "leaders" of these factions reserve their most bitter verbal and even physical attacks against the other faction or anyone who might question the status quo. Hamas "security" beat women in Gaza protesting for unity and Fatah "security" regularly arrest and imprison Hamas activists in the West Bank or even normal ordinary citizens who they suspect are not agreeing to their policies. This included one of my own students who missed important lectures as he was being questioned by fellow Palestinians. Absent a reasonably responsible leadership that puts the Palestinian cause ahead of factional and financial interests, this leaves most Palestinians desperate and frustrated. Decent people are in all Palestinian factions but they are afraid to speak out within their own faction. But then again, I say the Palestinians need to stop looking for salvation from current leaders, from Obama, from the Arab Spring or from anyone else. The 1936 uprising started when the young people took to the streets despite the bickering Nashashibis vs Husseinis of that era. It is time to do what young people have always done: depend on themselves unencumbered by the baggage carried by the older generation. I see this spirit in the young when I browse facebook pages in Palestine. We need to only put our own necks out and also help our children show courage to liberate us all from the corruption that has become like an illness spread among families and among factions. History will not be kind to those of us who join the corruption nor will it be kind to those who are apathetic and sit and wait.